Life is full of ups and downs, twists and turns, and true, you never know what’s coming next. Sorry to say, you’ve been lied too–Life is NOT like a box of chocolates. What he really meant is life is like a tire. I woke up early this morning, ready to give my family a big hug. It’s a special day and we wanted to celebrate the love we have for each other. Not the ooey, gooey romantic love couples have for one another, but the love we have for our family. For years we have been waking up at 4 am because we get quiet time, and get to focus for the day before our little ladies wake up. They always wake up early, usually before 6 am, so if we’re going to get a jumpstart on our day we have to wake up before them. The trouble is lately this has been extremely difficult for me. Waking up at 4 or even 4:30 am has been out of the question. It’s been more like 5-5:55 am–when the girls’ alarm goes off. This morning I spring out of bed and get an early start in the kitchen. I grab the trio of bananas, spotted, brown, and unfit for consumption. Finding the mixing bowl, I set to mashing them; my heart feels happy as I get to share some special extra special love that is usually only reserved for weekends. As you probably know, we don’t consume gluten because the girls don’t tolerate it. I use the gluten-free flour and the creation is heading into the preheated oven by 5:30 am. The girls aren’t even out of bed yet. Success! Fast forward an hour. The timer beeps letting us know it’s time to check the bread. My younger daughter is on my lap as I braid her hair and my husband checks on the bread. “It is perfect, a beautiful golden-brown all over. Your best yet”. My daughter rubs her hands together in anticipation. Seconds later we hear a crash and there’s no questioning what has happened. The wonderful gift I prepared for breakfast is all over the kitchen floor. Shards of glass fly more than seven feet. My heart is broken and I want to cry. My voice quivers. My younger daughter cries out, “Our banana bread,” as tears stream from her eyes. I know I have to pull myself together. “Accidents happen,” I say, still in disbelief. You have to be strong and squishy and wear a rugged overcoat so you don’t get worn down. I know the girls will each eat junk at school later. Sugar, dye, and gluten is a no bueno combination in their little bodies. I quickly check the time to see if I can still cook some bacon to get them some protein to start the day. It’s a little after 6, but I think we can pull it off. The oven is already preheated, so I line the stone cooking sheet with bacon and put it in the oven. Restaurants actually bake their crispy bacon. You might think it’s fried, but it is baked, not fried. We might be able to save something special this morning yet. You never know what’s coming as you travel the road of life. It’s helpful if you can be strong and resilient for endurance and long wear. There’s a lot of road to cover, so you’ve got to be tough. Be squishy, not as in soft. Be squishy as in pliable. You’re better off if you can be flexible and keep moving down the road. You will hit bumps, potholes, curbs and so much more. If you can be flexible you can keep moving down the road. If you run over a metaphorical nail you’ll run out of air. It happens. Sometimes you need to be rotated, and when you are threadbare you need to be replaced. Hopefully, you have a support network and can tap someone “in” when you’re worn out, sick, or need a little rest. Everyone needs an occasional break and self-care. We salvage our morning with some bacon and oatmeal to ensure the girls get some proper nutrition to start the day. We know they will consume more candy than they can tolerate at school. We can’t control what happens there, but we can set their day right with adequate nutrition to start the day. Life will go on and we’ve got to keep rolling. Are you like a tire? “Life is like a box of chocolates,” makes life seem too sweet. Too sweet and you get rolled over. You have to be tougher to walk the situations life presents. You have to be built for longevity, much more like a tire, and soft enough to bounce. 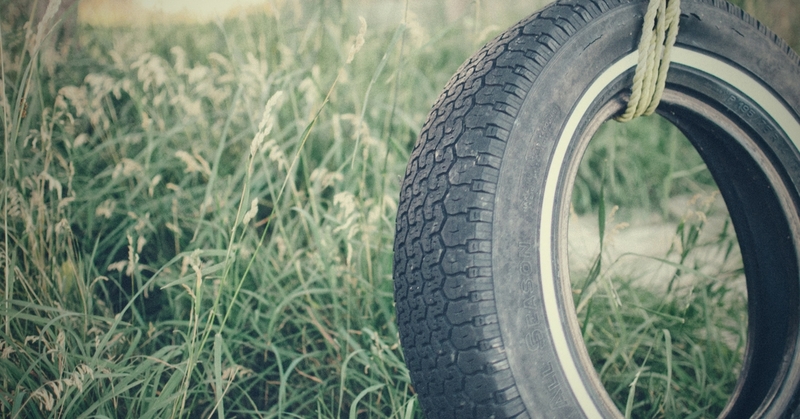 Are you like a tire, or hard and rigid? How do you roll through life? I’d like to say I’m always flexible, but it simply isn’t true. Sometimes I’m rigid. I feel those life events more harshly than I do when I am pliable. There’s a life lesson everywhere if we allow ourselves to see it. This morning we were able to be pliable, probably because we had the margin of extra time. How do you roll through tough times? Are you tough and rigid, or soft and pliable? Tell us a story in the comments and share how your actions or reactions shaped the outcome. See, I always had my doubts about Forest Gump. Must have known he was up to no good. Back in Africa using & buying “retreaded” tires was a commonplace act. In Canada, I soon learned about all-season and “winter” tires. Have tried them all. The tires on my vehicle are heavy, hard even. And, if one’s vehicle stood outside for a while, especially in winter, it’s as if the tire had become partially square! It has to soften a bit before it becomes a smoother ride. Back to chocolate again—I agree with Forest a little. Life is like dark chocolates: an eclectic mix of bitter and sweet. Thanks for the post, Nicole! You are correct, I have not considered chocolates with ginger. Ginger is so good for us. Grateful for your tire-life perspective. I haven’t been to Africa and would not have this knowledge if you had not shared it. From Africa to Canada I imagine a vast difference in life and life perspective. An interesting thing, this life we live, and how where we live shapes us and our futures. Curious if you have been a world traveler and have any other experiences to share. Dear Forrest, for all the life he lives in the movie, ought to have a harder outer shell. He’s been through leg braces, made fun of, and experienced so much life. I find it strange that he thinks life is like a box of chocolates. I think too sweet in this life means a person gets rolled over. I like your bitter-sweet perspective. Life is some of both, and we have to be resilient to roll through it.